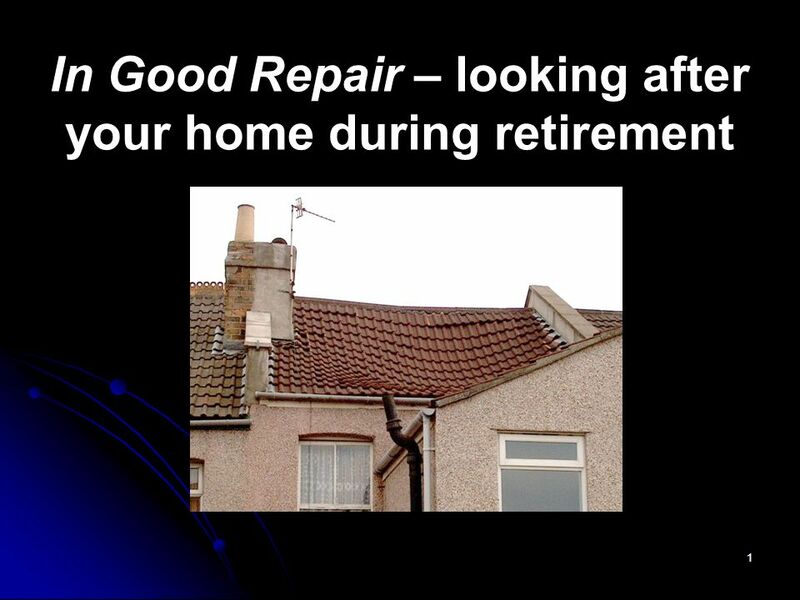 1 In Good Repair – looking after your home during retirement. 2 2 In Good Repair Ever wondered if adaptations to your home would make it easier to manage? 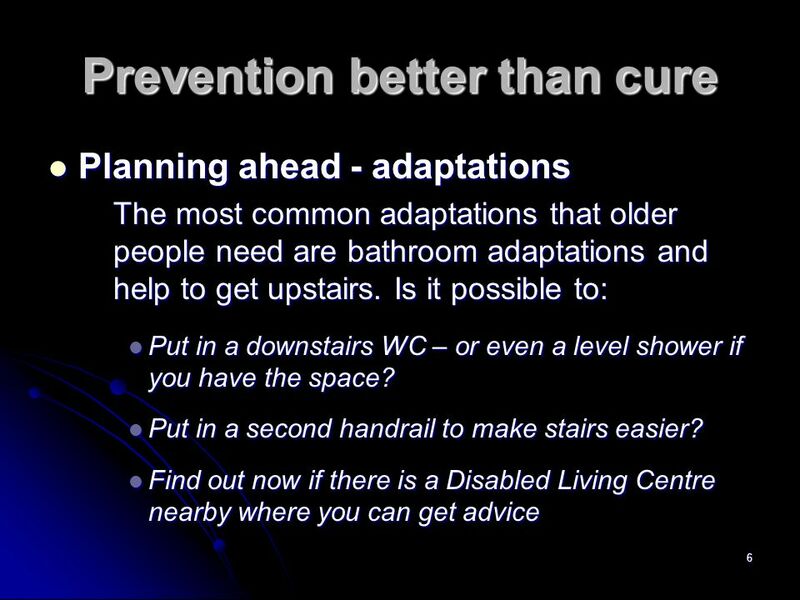 Ever wondered if adaptations to your home would make it easier to manage? Does your home need some repairs? Does your home need some repairs? Worried about paying for building work or finding a good builder? 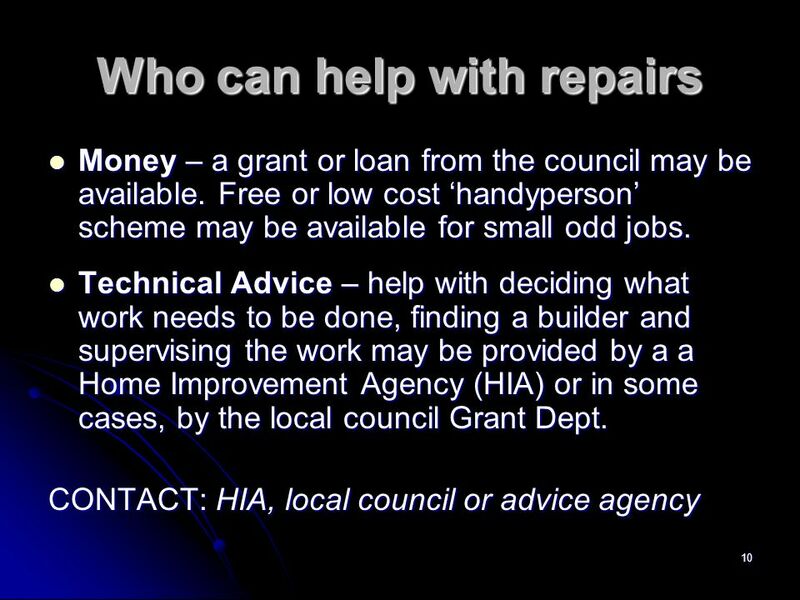 Worried about paying for building work or finding a good builder? Then this information could be useful! 3 3 Where do most people want to live during retirement? Most of us want to continue to live in ordinary housing, often in our current home. Most of us want to continue to live in ordinary housing, often in our current home. Making sure that our home is warm, comfortable and adapted can help to make this possible. Making sure that our home is warm, comfortable and adapted can help to make this possible. 5 5 Home front If you own your home it helps to keep on top of small repairs. 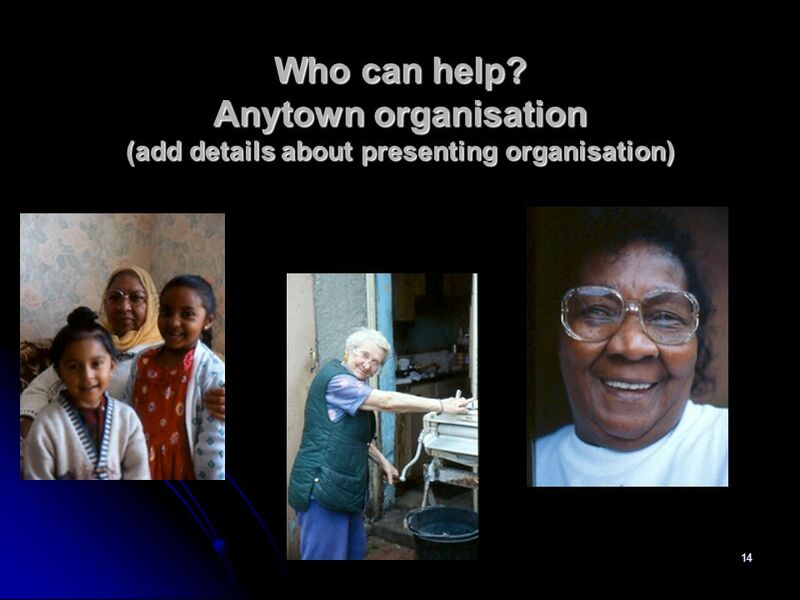 There may be a local odd job service that can help. 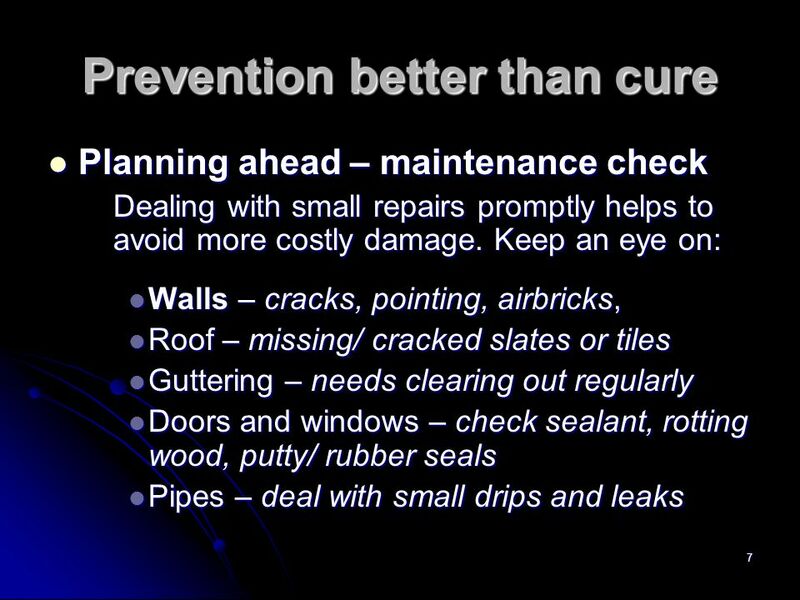 If you own your home it helps to keep on top of small repairs. 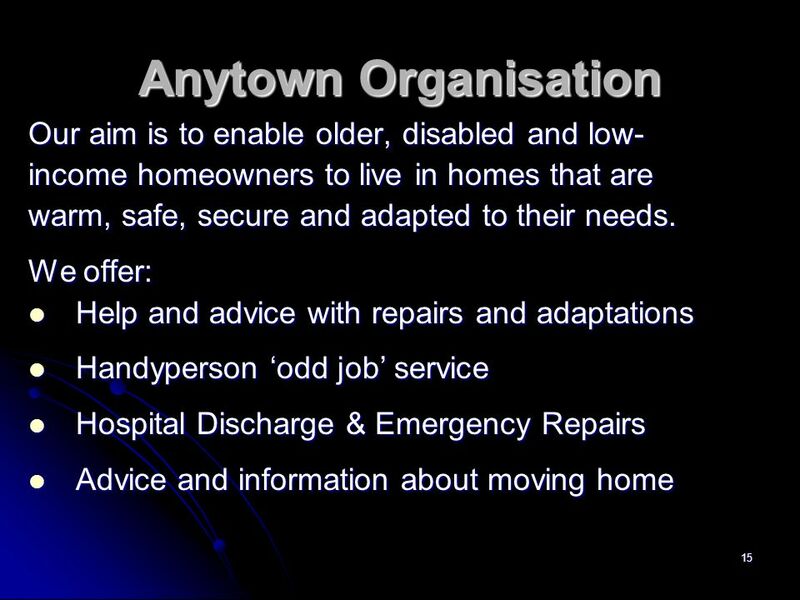 There may be a local odd job service that can help. 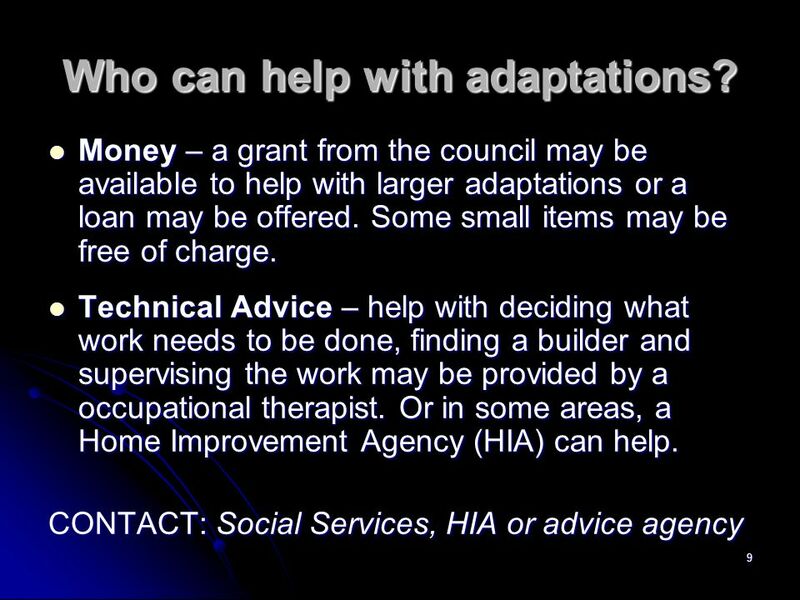 For both tenants and owners, social services can help with small adaptations. 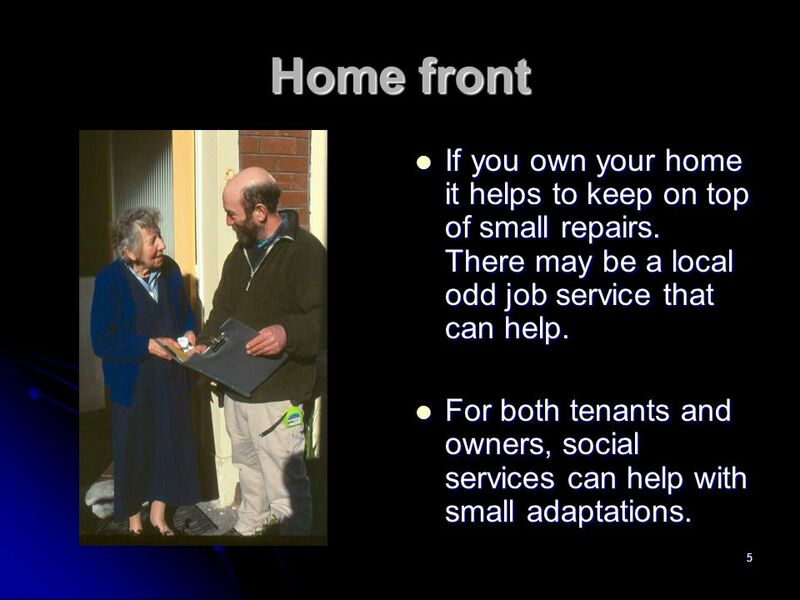 For both tenants and owners, social services can help with small adaptations. 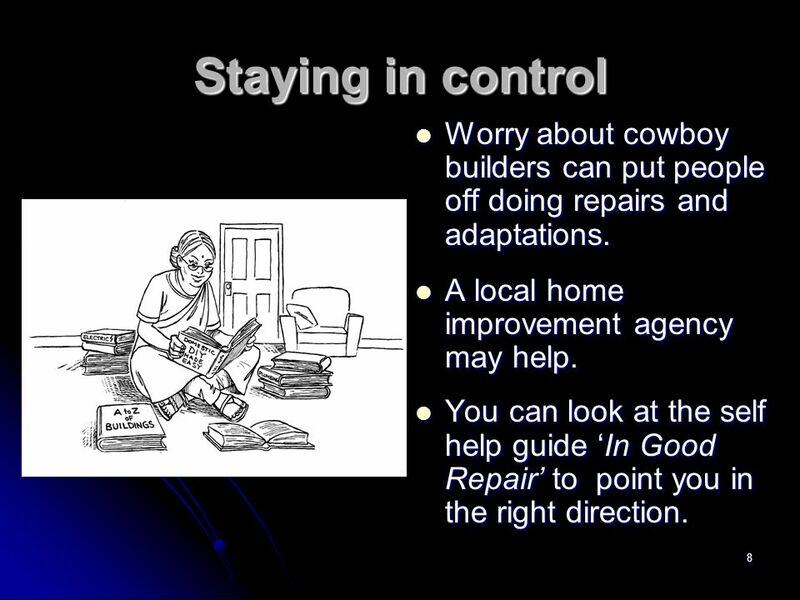 8 8 Staying in control Worry about cowboy builders can put people off doing repairs and adaptations. 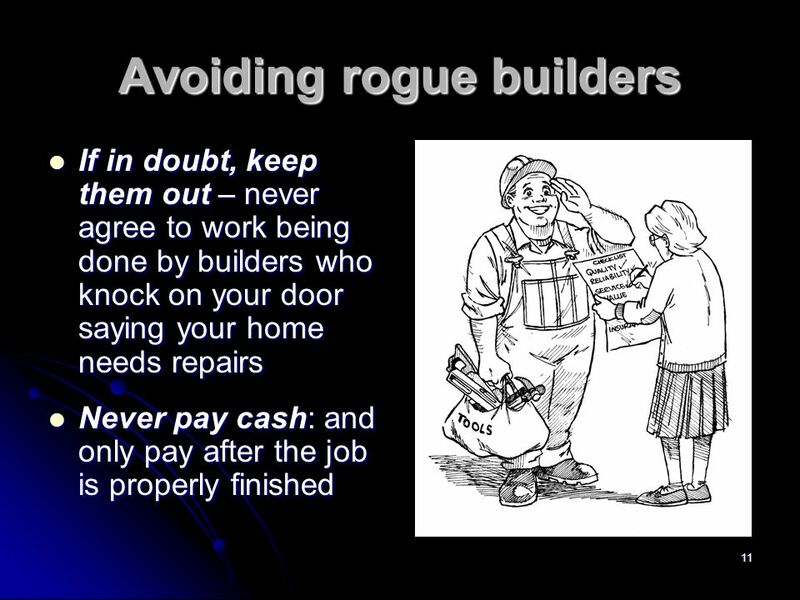 Worry about cowboy builders can put people off doing repairs and adaptations. A local home improvement agency may help. A local home improvement agency may help. You can look at the self help guide In Good Repair to point you in the right direction. You can look at the self help guide In Good Repair to point you in the right direction. 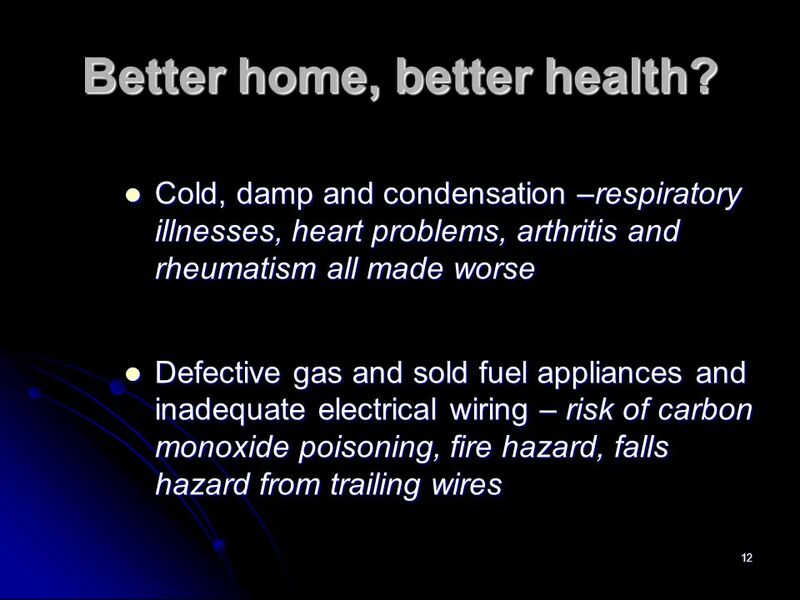 12 12 Cold, damp and condensation –respiratory illnesses, heart problems, arthritis and rheumatism all made worse Cold, damp and condensation –respiratory illnesses, heart problems, arthritis and rheumatism all made worse Defective gas and sold fuel appliances and inadequate electrical wiring – risk of carbon monoxide poisoning, fire hazard, falls hazard from trailing wires Defective gas and sold fuel appliances and inadequate electrical wiring – risk of carbon monoxide poisoning, fire hazard, falls hazard from trailing wires Better home, better health? 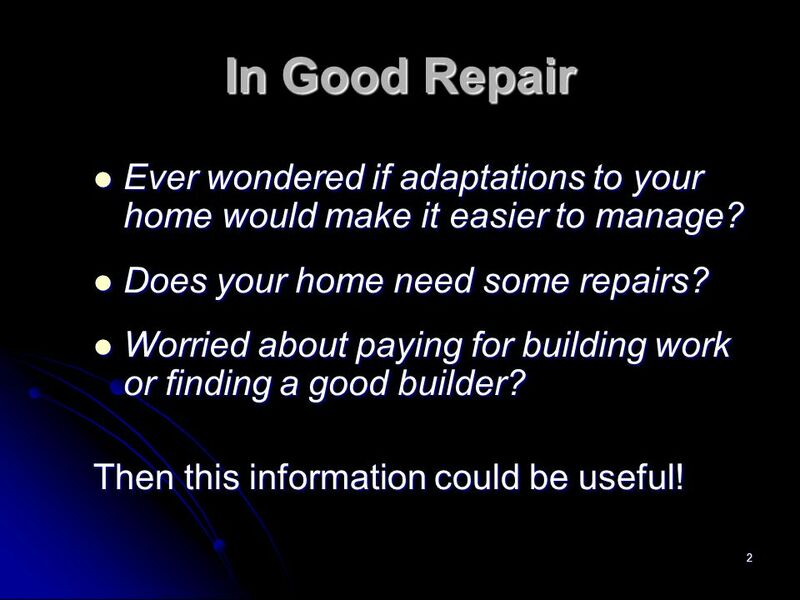 Download ppt "1 In Good Repair – looking after your home during retirement." 1 Housing in Retirement. 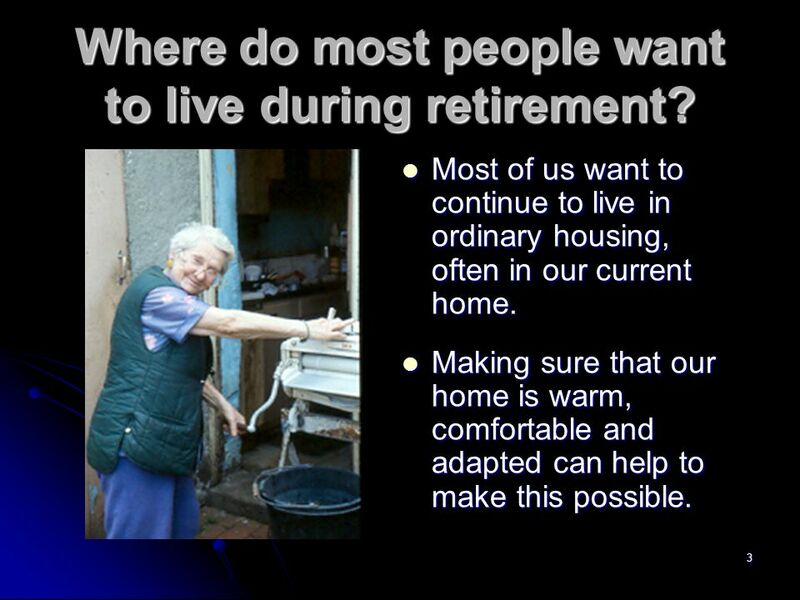 2 Where do most people want to live during retirement? 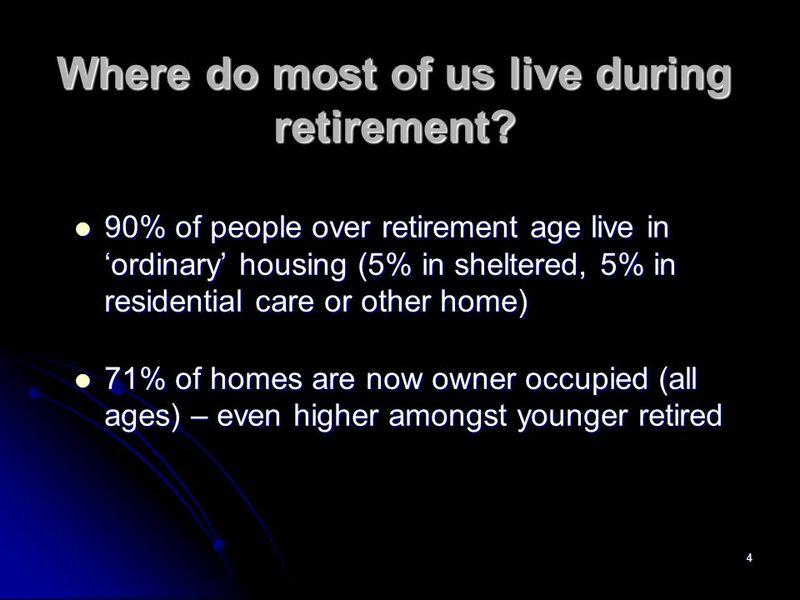 Most want to continue to live in ordinary housing, often in current home. Babysitting Safety How to Stay Safe While Caring For Others. Affordable warmth Causes and remedies for the private rented sector. AN UPDATE ON SIDE YARD VENTING PRESENTED BY: HOWARD ANDERSON, BRUINS PLUMBING (EDMONTON, RED DEER) DAVID MACTAVISH, EMCO (CALGARY, LETHBRIDGE) Builders. Copyright 2007 Thomson South-Western Chapter 6 Personal Risk Management. Elderly Revision S grade Questions Credit & General KU Questions. Ensure you have a copy of the contract Which scheme is holding the deposit? 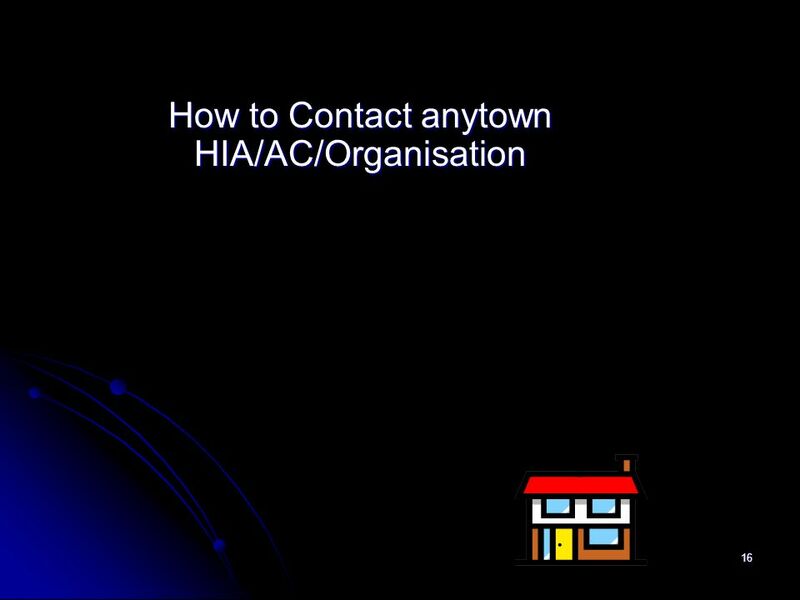 Take telephone number / address of Landlord Arrange a time for the inventory. Successful House-hunting. Don’t Panic There are plenty of houses Most people find suitable accommodation Take your time don’t get rushed into something. Obj Experiment ways to organize living space. Multifaceted research programme 1. Review and analysis of government survey data relating to fuel poverty and older people (RoI,NI) 2.Exploratory non-representative. Copyright Big Energy Saving Network 2013 Session objectives To explain:  payment and tariff options  fuel bills and the annual statement  how to switch. 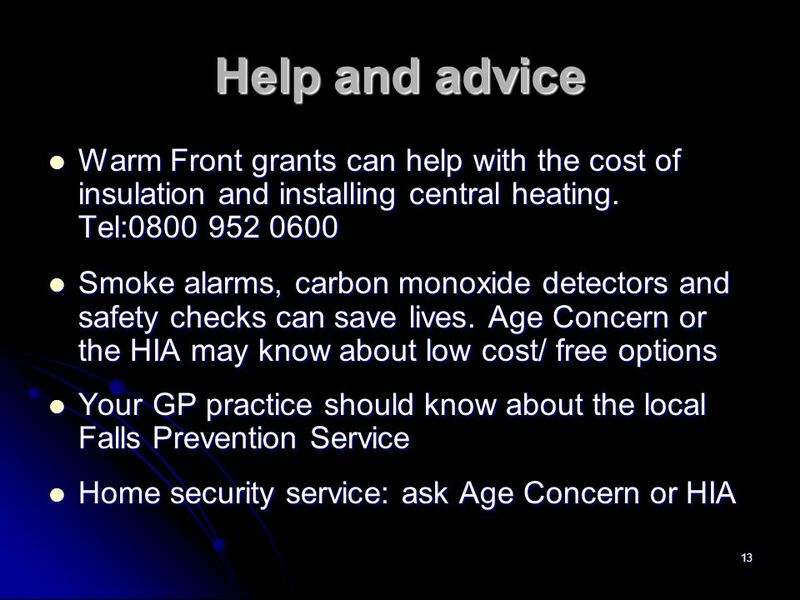 Identifying and referring residents in fuel poverty and/or at risk of ill- health due to living in a cold home Nigel Farren Energise London CIC. A Home Energy Workshop. Developed by Central Vermont Community Action Council In partnership with Efficiency Vermont. Affordable Warmth Update Bolton Tina Gandhi, Housing Strategy Officer Strategic Housing Services.